Striking architectural design in a lush PRIVATE tree lined setting define this Rustic Modern new construction! Single level floor plan on Â½ acre pool sized lot, boasting clean contemporary lines & exquisite custom finishes. A dramatic cantilevered steel entry framed by glass & cumaru wood detail welcomes you. Large Western sliders on either side of great room allows seamless indoor/outdoor living --- west-facing dining patio and expansive interior courtyard. Incredible floor plan - FRUIT TREES GALORE., ...Master on one side of the house, with 3 bedrooms and large games room on the other. Large bedrooms and bathrooms. Huge walk in pantry. Large format concrete tiles wrap the fireplace and bleached white oak hardwood floors create a warm and inviting atmosphere for entertaining friends. A sumptuous master suite offers a private, covered patio with steps down to the lushly landscaped backyard with room for a pool. The master bathroom is a resort-like escape with soaking tub, large walk-in shower with multiple shower heads and custom tile detail and designer lighting. An optional game room/den/office or additional bedroom is off the dining room separated by a custom distressed wood barn door. The three large secondary bedrooms offer great natural light and designer selected bathroom fixtures and tile detail. 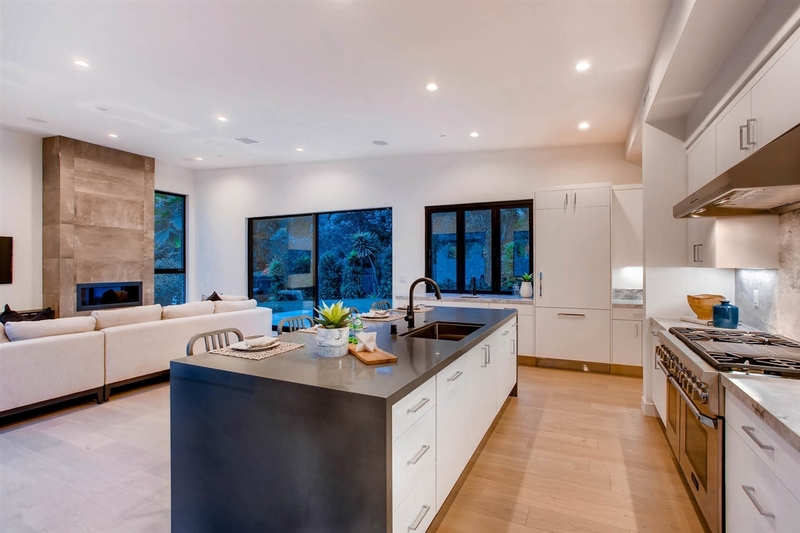 The stylish kitchen boasts a waterfall island with seating for casual dining, artistic dolomite counter tops and bi-folding pass through window to the outdoor dining patio. A perfect location with easy access to the freeway, Rancho Santa Fe and Solana Beach shopping, restaurants and top-ranked Olivenhain Pioneer school.